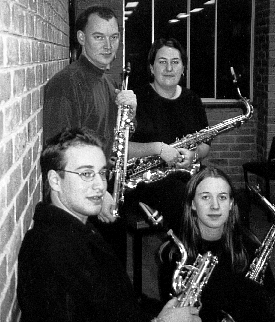 The Southern Cross Saxophone Quartet was formed in 1998. The ensemble consists of Michael Lichnovsky (soprano saxophone), Heather Tyas (alto saxophone), Georgia Parry (tenor saxophone) and Gideon Brazil (baritone saxophone). They play a range of repertoire from Baroque to contemporary, and are regarded as one of the leading chamber ensembles of the University of Melbourne (Victoria, Australia). They have performed with great success at many venues and competitions in Victoria and interstate. They are thrilled about making their intemational debut at the World Congress in Montreal, 2000.